hetalia Ask ze awesome Prussia! Come on and ask!i know you want to! Heya Prussia~ I know it's kinda early to say this but what do you want for Christmas this year? And what would you do if you ended up on Santa's naughty list? OMG Pussia. xD That "Kesesese"..
Anyways, if America was claimed more awesome than you, how would you feel, and what would you do? @IndigoIchigo,Well i wouldn't like it at all and i would beat him up!IM AWESOMER!!!!!! 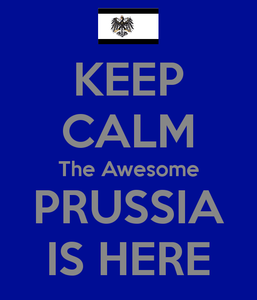 Heya Prussia! I'd like to ask the same link America. Anything you can do to cheer up an old lady? @Tinekraut,yeah!i have alot of things*smirks*....keseseskesesekesese!i could make germany wear a dress! What do you think of my username, by the way? Bro, you can call me Tine. My friend claims she is awesome ... I claim I am random ... what do you think ? @Kakashi_355. Mien awesome brother Germany!!! Dear god of awesome. What was Germany like when he was a kid? @Cheesiecorn.he was very adorable!and he would always read books and cuddle when we took naps! Prussia-san, what do you think of Hungary and Austria? Mr. Prussia, are you friend with Mr. Russia?